Again a comfort food from Gujju family!!! 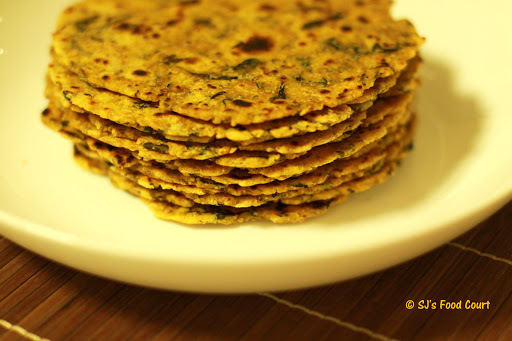 :) “Methi Thepla” is an authentic flat-bread prepared often for picnics, long distance travelling, monsoon, tea-time, tiffin box… You can call it ‘Bread-Butter’ for a Gujju! A dollop of ‘Chhunda’ (a kind of Sweet Mango Pickle) and a thepla… and tummy full :) Spread it, roll it and enjoy…. – Mix wheat flour, cumin seeds, sugar, turmeric powder and salt all together in a bowl. – Roughly chop fenugreek and mint leaves. Add them into the bowl along with chopped green chillies. – Add around 2 tsp of oil into it and mix everything well. – Knead a soft dough using lukewarm water and cover it with a damp cloth. Keep it aside for sometime. – Make lemon-sized balls out of the dough and roll them out to make around 7-8″ in diameter. – Heat a flat griddle and put one onto it. Cook it for nearly 30-40 sec and flip it. – Apply a little oil on partially-cooked surface and flip it again. Repeat the same process again. – Cook it on both the sides evenly until golden-brown spots appear on it. Make remaining thepla the same way. – Methi thepla are ready to serve!!! – Serving it with a cuppa tea and a pickle of green chillies is the best combo ever!!! it looks yummy and healthy with methi leaves…. Will certainly try these out am always envious of perfectly made theplas…they look ever so delicious :). Somehow I never imagined combining Methi with Pudina. Thanks for this Shruti!